I'm always looking for fun home items for our new house. I recently was sent a beautiful wooden serving tray from Spruce Bay in exchange for a honest and unbiased review. We'll be using this tray in our new front hall to collect things like key, mail, etc... It's a simple design, which means it would work in almost any home. The tray would make a perfect house warming or bridal shower gift. I really love the sentiment as well, "There is no place like home" one of the classic movie quotes. This is perfect to see at the end of a long day. I love this tray and will be using it for years. There are affiliate links included in this post. I do receive a small commission but, this does not affect my opinions. House Renovation Week 11: Windows! This week saw the installation of most of the windows. We finally got to see what the front of our house is truly going to look like when finished. Also this week the footings for the mud room and front stairs. On Monday, the footings were dug for the front hall and the new stairs to the basement were installed. The new dining room windows were installed on Tuesday. These three windows are one solid piece, our contractor said it was quite heavy. These windows replace the fireplace and mantle. All the windows in the front of the house were installed and a couple on the side. This house is coming together. The footings for the front hall and front stairs were started. All the windows except for the large fixed window were installed on Thursday. Rain should no longer be an issue for us. By the end of the week we had windows! The footings for the front hall, stairs and deck stairs were poured. We also ordered our bathroom faucets and shower controls. It is going to be a very busy fall with all the decisions we have to make in the next few months. Recently, I was sent a fun new game to test and review by Thinkfun. The game was Clue Master, it is a logic based single player game that develops your ability to see patterns. We have been having a blast playing this with our five year old. The game is designed for ages 8 and up, but we found that our five year old could play this game with our help. I found this game to be similar to Sudoku in that you are trying to figure out which item goes into which box in a 3 x 3 grid. My five year old has wanted to play this game non-stop since we got it. She is really having a great time figuring out the puzzles with us. This game is great for math, science and deducting skills. Fun and educational, we'll be playing this for years. 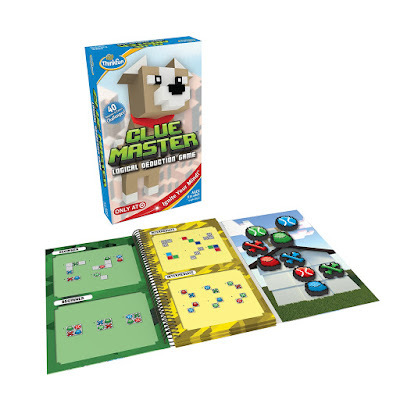 You can purchase this game through my Amazon.com affiliate link and be sure to go to www.thinkfun.com to check out all their other fun games. I do receive a small commission from the affiliate link but, this does not affect my opinions. Disclaimer - I received this product free of charge in exchange for a honest and unbiased review. This week saw more stairs installed, the roofing went on and even more framing. It was pretty exciting to be able to walk up to our new third floor/attic space. On Monday, they continued to work on the stairs to the third level. Tuesday saw the completion of the stairs to the third floor. It was exciting to see how much storage space that we were going to have in the new house. Tuesday night around 6 pm we saw someone throwing wood off the side of the house and then realized it was the roofer installing the water barrier. Wednesday saw the completion of the roof, which should help with getting less water in the house. Inside the framing for the attic walls were completed. The plywood wall for extra structural support was installed next to the stairs on Thursday. This was originally going to be open somewhat but the contractor felt that we needed the extra structural support. I'm all for the house being sound structurally. They also installed the plywood for the sub-floor on the 2nd floor. On Friday, they took out the wall between what was the girls room and that was there toy room. This space in the future will be our new office/guest room. During this week we also started research into the bathroom fixtures. This week saw the installation of the stairs from the 1st floor to the 2nd floor. This week was a tough one for weather, two days there were heat advisories with temperatures in the high 90s and then one day we had torrential rain all day. Amazingly the guys still got work done in our house. On Monday, they worked on finishing up the trim on the roof. The roofing supplies were delivered, but due to the heat advisory the roofers could not install the roof. They were not able to work on Friday either, it was so oppressively hot. They were able to build the staircase to the second floor, this was great because we got to show our daughter her room. They also framed the window for the front of the house. This window is actually three windows built together. This was another incredibly hot day. This day saw the beginning of staircase to the attic.